The Teraflex Falcon Series 3.1 Piggyback Shock Kit takes Jeep handling and suspension to the next level. This 100% bolt on kit was precision engineered for the four door JL Wrangler. Teraflex uses their proprietary Volume Optimized Damping (VOD), which offers race-inspired performance, on road comfort, and off-road performance all in one package. The VOD design increases low speed control, and reduces the chance of high-speed bottoming out. Unlike universal shocks, Teraflex designed their Falcon Series 3.1 Piggyback Shocks with the Wrangler JL in mind. The front shocks utilize horizontal reservoirs for better wheel well clearance. For increased suspension articulation, Teraflex uses built in offset upper spacers and lower eyes. This allows the shock a full range of motion without binding. Falcon shocks are backed by Teraflex’s 3 Year Limited Warranty, and are fully rebuildable and factory serviceable. Piggyback Shocks: The additional reservoir of the Falcon Series 3.1 Piggyback Shocks increases the shocks gas and oil capacity. This allows the shocks to stay cool, even under harsh conditions. Heat buildup causes fade and diminishing shock performance. 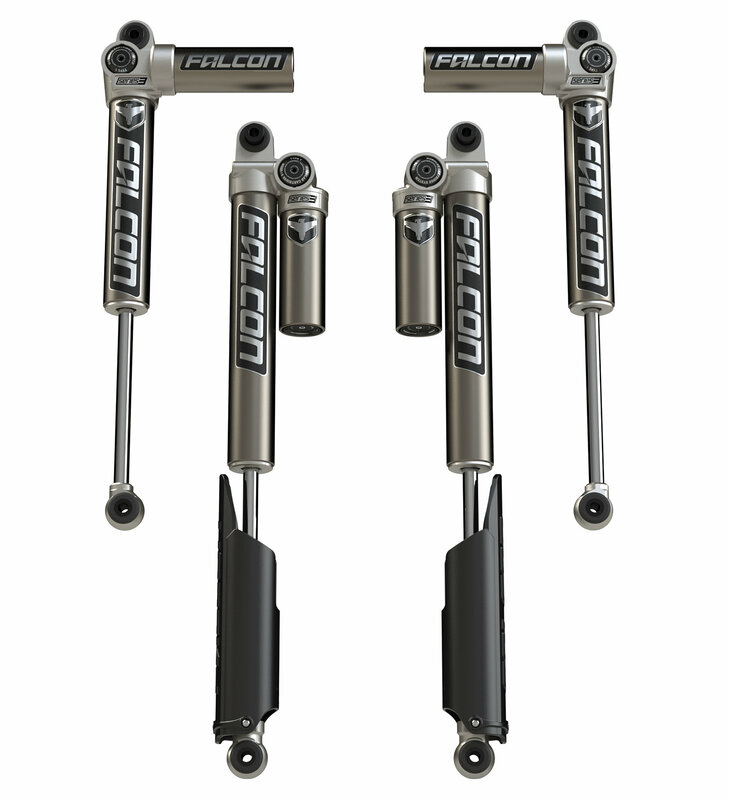 Upgradable: Falcon Series 3.1 Piggyback Shocks are modular and can be upgraded to the 3.3 Adjustable Piggyback Shocks with the additional purchase of Teraflex’s Falcon 3.3 Fast Adjust Cartridge Upgrade Kit (part number 00-10-33-400-160). They are also compatible with the Falcon 3.3 Air Adjust Cartridge Upgrade Kit (part number 00-10-33-400-160) for on the fly adjustments at the flip of a switch. The Teraflex Falcon 3.2 Tool Adjust Cartridge Upgrade Kit (part number 00-10-32-400-160) is also available for fine tuning with a hex key. Vehicle Specific Design: Teraflex engineered these Falcon Series 3.1 Piggyback shocks specifically for the two door Jeep Wrangler JL. They are side specific, and feature built in alignment spacers and offset eyes for optimal clearance and suspension travel. Race-Inspired Performance: These shocks feature fixed rate damping and improved dynamic roll control for increased vehicle stability both on and off road. Shock Body: The 2.25” shock bodies are constructed from heavy duty 6061-T6 aluminum alloy for heat dissipation and wear resistance. The internals are smooth honed for long lasting performance. Shock Oil: For increased thermal stability, Teraflex uses full synthetic red line shock oil. This oil contains anti-wear and lubricity additives, and has a high viscosity index of 519. Shock Piston: Falcon shocks utilize a hard-anodized billet digressive linear piston for superior strength and longevity. Teraflex uses a 1-piece Teflon bronze piston wear band with an O-ring and an inline oil/gas separator (OGS) to eliminate oil aeration and shock fade. Shock Shaft: Unlike other shocks on the market, Teraflex uses a heavy duty 3/4” chrome plated shaft. They are induction hardened for optimal damage resistance. A large diameter shaft allows for high precision tuning. Rust Proof Hardware: All hardware withstands a 1,000-hour salt spray corrosion test. Rear Roost Guards: The included roost guards protect the rear shocks from rock chips and off-road hazards. Lift Range: 0 - 2.5 inch or 2.5-4"